Well it has been another fun month over here on Truth or Lie? We have had some great guests, and their lies have been revealed below. However I am finding not many of you are taking part in guessing, please do have a guess, its all a bit of fun, although I am giving away a prize to the top guesser over the course of a 4 week period. 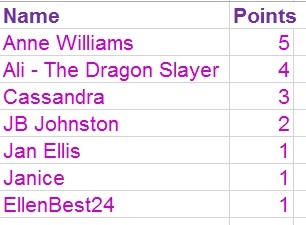 Speaking of which, I need to make a leaderboard and let you all know this month's winner! Well barely anyone guessed Cassandra Parkin's lies, and with this being quite a low scoring month, just think a couple more goes and you could have been topping that leader board. Congratulations to Anne Williams - you have won a paperback of your choice. Please message me to claim your prize. And finally the moment you have all been waiting for, the lies revealed for Linda Hill, Jo Lambert, Renee Conoulty and Cassandra Parkin. Don't forget to take a look at the new post that went up yesterday, to start taking part in the new month. Week 1- I had Linda Hill as my guest, and she had some realistic sounding lies. So here is the truth! Question 5 - If you could be an animal what would you be and why? T: I'd be a cat. I love their independence and their sinuous lines. Question 12 - Besides reading, which I am guessing is a given, what other hobbies do you have? T: I love to travel and have been all over the world. My husband and I decided to start out as far as we could and work our way in as we got older, so we've been to Antarctica and Australia for example and eventually we'll just go on the bus to Stamford, the nearest town to where we live. F: I love football! I support Leicester as it's quite near to me and I can't believe how well they've done this season. Amazing stuff. I just wish I'd been able to get tickets for a couple of the home games - or I'd put a bet on them at the start of the season. Question 15 - What are you most scared of? T: Enclosed spaces. I'm really claustrophobic and can't travel in the back seat of a 2-door car. I hate lifts too and would rather walk 10 floors than go in a lift. F: Spiders. I think it's the way they scuttle across the carpet and sneak under furniture. One dropped on me from the ceiling when I was a child and I think that's where the fear came from. And then in Week 2- I had Jo Lambert as my guest, and I wonder if her short but sweet answers confused you all? Question 7 - If you could choose anybody famous to star in the story of your life, who would it be? Question 9 - Who is your ideal Disney character? Week 3 brought us Renee Conoulty, but did she fool you? Question 3 -What are you most scared of? [Lie] I’m most scared of frogs. The thought of their slimy skin touching mine makes me shudder. Ergh. Question 7 - If you could be a fruit, what would you be and why? [Lie] I would be a coconut, so I could live on a tropical island and watch the sun set over the ocean every day. [True] I would be a watermelon, preferably a time travelling one so I could live in the hope that someone might carry me onto the Dirty Dancing set and anyway, everyone loves watermelon. Question 11 - What is your dream job, and have you tried to achieve it? [Lie] My dream job is to be a Physiotherapist. I tried, but failed three times and dropped out of uni. And finally in Week 4, Cassandra Parkin was our not so truthful guest. Question 6 - If you could be a fruit, what would you be and why? LIE: I would be a Kiwi, just because they’re my favourite! They’re such a cool, weird-looking fruit. TRUTH: I would be a Nectarine – not as sweet as a peach, but much more interesting. Kiwis are like eating snot out of a hollowed-out testicle, and when I am King I will make them illegal. Question 8 - If you could only read one author for the rest of your life (and I’m aware that’s a very scary world), who would you choose and why? LIE: This doesn’t quite fit with my Favourite Authors answer, but I’d probably have to pick James Joyce – just for one single book, though, which is Ulysses. I read it on holiday when I was nineteen and it changed my life for ever. It’s the book I’ve gone back to most often throughout my adult life and I find something new each time. TRUTH: As a young English Lit student, I was determined to get my head around James Joyce, so I once deliberately marooned myself on holiday with no access to shops or libraries and nothing to read but Ulysses. I ended up making a very nice needlepoint cushion with a picture of a Chinoiserie teacup. My One Author would definitely be Jane Austen – I don’t think I’m ever not reading at least one of her books. I have never yet managed to finish Ulysses. Question 11 - Did you have an invisible friend as a child? If so please tell me about them. LIE: For years and years, I had an invisible tiger-cub called Archie. He was quite fierce and wild and dangerous to everyone else, but we had a very special bond, so obviously he never did anything to hurt me. (Obviously.) He went with me everywhere, slept on my pillow, understood me and took my side when no-one else did, and crept out in the night to bite the toes of people who had upset me during the day. He finally vanished round about the time I went up into Junior school. I like to think he’s living in a lovely forest somewhere, hunting down all the other Imaginary Friends who are unwary enough to cross his path. TRUTH: My one experiment with having an Imaginary Friend was when I heard my mum talking to a group of her friends and telling them that I didn’t have an Imaginary Friend, and never had. Somehow I took from this that she was worried about my lack of made-up companions, so to cheer her up I faked one for about three days, until I got bored with it and forgot. He was a boy, but he was so unconvincing that I can’t even remember his name any more. Thank you everyone that has taken part in month 3 of Truth or Lie? I really appreciate everyone's comments including those that just mention on twitter how hard this is, why not have a go next time, you never know you may win a prize.